Who better to organise and host a memorial fundraising event than JCH Event Solutions. 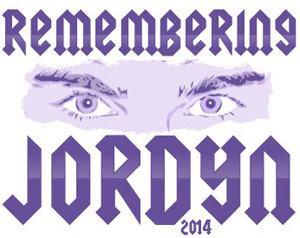 On Friday 7 February 2014 Revolt Art Space in Kensington Victoria will host the inaugural ‘Remembering Jordyn’ event. Jordyn Hare was a dear employee at JCH Event Solutions from the moment we opened the doors for business. His passion and industry knowledge for such a tender age could not be faulted and he was just an absolute pleasure to have on any event. However tragically in February of 2013 he passed away suddenly after an epileptic seizure – his death hit everybody extremely hard. In July of 2013 we started scheming the concept for this fundraising event which will not only bring family and friends together but anyone who has been associated with epilepsy themselves, family members, friends or colleagues. It will be a great night full of entertainment! The outpouring of support from the moment we hit the phones was incredible and we were able to secure prominent Melbourne rock icons White Widdow and Chinatown Angels for very rare live shows. We also have a couple of acoustic sets from the phenomenal Aaron Jamez and DJ Fedora will keep the breaks rocking. 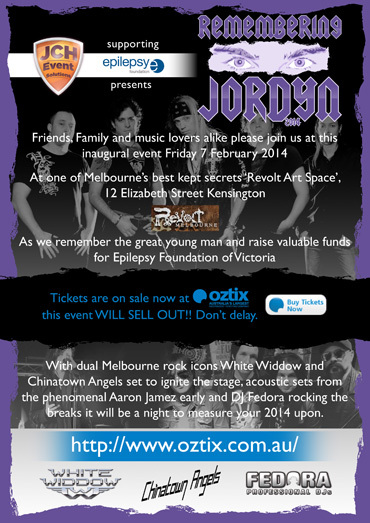 There are still a handful of tickets left through Oztix at http://tickets.oztix.com.au/?Event=40861 so do something good for your soul to start 2014 – come support JCH Event Solutions, but more importantly come raise valuable funds for Epilepsy Foundation of Victoria while remembering a great young man.